[Updated] Unknown network fault leaves customers cloudless. Microsoft's Australia Azure East region suffered a major network infrastructure interruption on Friday that left customers unable to connect to their cloud hosted services. 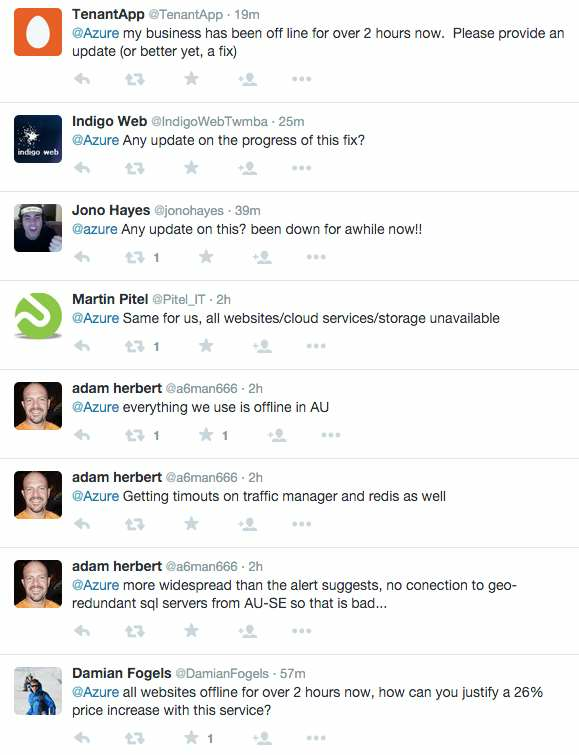 The Azure team tweeted a service alert for Australia East at 12:48pm AEST, with a link to its status updates site. While the Azure status page listed all services such as virtual machines, batch jobs, remote apps, and storage marked as operating normally for Australia East, customers were unable to connect due to an interruption to the network service infrastructure. Microsoft confirmed the interruption to iTnews on Friday and said the team was working to restore services. Engineers were deploying mitigation steps, the Microsoft Azure team said, but provided no further details on the fault or an estimated time of service resumption. Some users reported all services as being offline. The outage lasted around seven hours. Over the weekend Microsoft said all services were restored and the incident had been mitigated. Azure suffered a worldwide service outage in November last year after a configuration change wreaked havoc in the storage front end, causing customer virtual machines to hang for several hours. Only the Australian Azure regions along with Brazil South were unaffected by the November outage.